Corner Combination jewelry showcases enable corner areas to be usable merchandising space without having to purchase a separate corner unit. 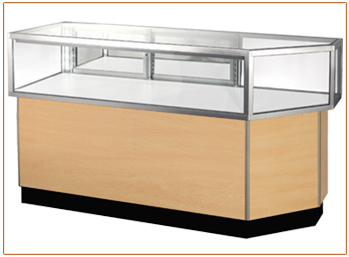 A combination jewelry display case is designed as a regular Streamline jewelry showcase with an extended 20” corner. Display cases are joined to the corner combination on the door side of the added section. Overall dimensions are 20" deep and 38" high. Glass display area is 12" high and 20" deep. Wood base is 22" hight and 17.5" deep. Black kick base is 4" high. When lined up with other Jewelry showcases, the base and display area matches adjacent cases. Ü Corner Combinations are available for right and left configurations. From the customer side, specify if the corner should be on the left or right side of the case. Ü Standard cases have a dummy glass in the corner where the combination case joins another showcase. Specify standard glass, mirror, panel, or open corner. To view more showcases from the Streamline Jewelry series, click here. Specify left corner or right corner. Note that 36" and 48" cases come with 2 standards.